The urban transformation of Kiruna, northern Sweden, has gained attention around the world. Around 6,000 people will be relocating together with many public and commercial spaces when LKAB needs more land for mining iron ore. What is less known is that the whole community of Malmberget, a ten minutes' drive south, will be discontinued and demolished. All residents will have to move, mainly to the nearby town of Gällivare. Both Kiruna and Malmberget have grown next to large ore deposits. The mining operations affect the soil, which calls for a relocation of gigantic dimensions. 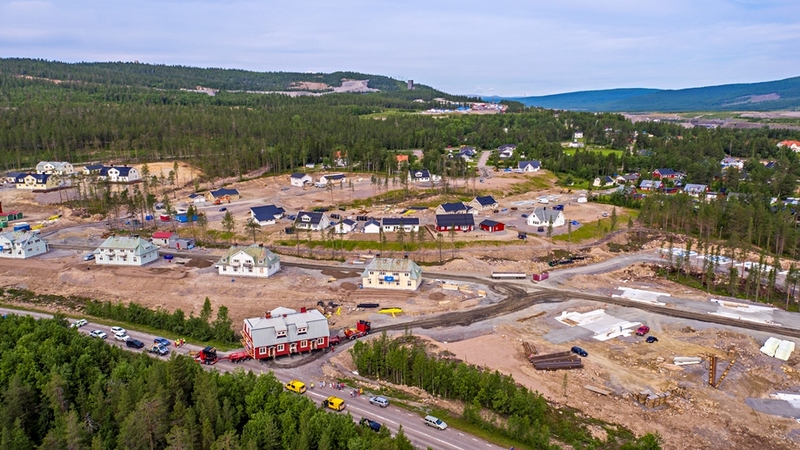 In Kiruna, the preparing infrastructure work has been going on for many years – new roads have been built and the railroad has been moved, but it is only this year that the first houses are moved and the transformation of the city becomes more visible. In Malmberget, the situation is completely different. "There the urban transformation has been going on for over 50 years. It began with the relocation of the church in the 1970s. But now the continuation of the underground mining requires that the whole community is shut down and relocated to the nearby Gällivare, which will be densified and rebuilt," says Erika Lindblad, Communicator at Urban Transformation, LKAB. The relocation from Malmberget to Gällivare is estimated to be completed in 2032. Around 3,200 persons and approximately 74,000 square metres of public premises will be moving to new addresses. However, it is not all just about demolishing and rebuilding. Around 30 of LKAB's cultural heritage buildings in Malmberget will be preserved and relocated to the nearby Koskullskulle. These over 100-year-old heritage buildings are built solid, usually from timber and with rich carpentry. The houses will be lifted up and transported on a trailer to their new home seven kilometres away. In spring 2018, 25 of the 30 houses have been placed on new land. Most of them already have new heating, water and sewage installations, set up by local fitters from Caverion. The company has also renovated details on the sheet metal roof. "It takes a bit of extra work to renovate the HVAC system in old heritage buildings. But it's fun to be part of making the beautiful houses inhabitable again," says Erik Karlsson, Regional Manager of Caverion Malmfälten. Erik lives in Gällivare and sees how the relocation of Malmberget affects the community on a daily basis. New buildings, both residential, commercial and public, are being built everywhere. "Caverion and everybody who lives here are part of a unique and exciting project that affects the whole population. 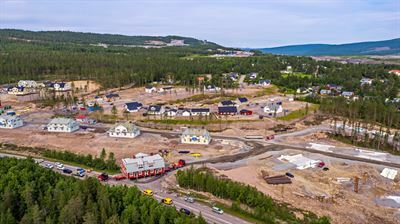 It's not every day that entire communities are moved, or that a community of Gällivare's size is simultaneously building a new secondary school, a care home, a swimming pool, a sports hall and a preschool," says Erik Karlsson. In all, around 5000 homes and 700,000 square metres of housing and business premises will be replaced in both localities. This means that some 10,000 people – roughly a quarter of Malmfälten's population – will need to move. Also 160 shops and companies have to move. The urban transformations are estimated to continue at least until 2035, when the current main levels will have been extracted. If LKAB decides to dig even deeper, the relocations will continue even further.